Snickers 'The Brady Bunch' by BBDO New York. Last week, Snickers released a teaser for its Super Bowl spot by BBDO New York, promising viewers that if it received enough hits, the ad would be released ahead of the game. In that clip, fans of the candy and 1970s sitcom "The Brady Bunch" got their first look at screen tough guy Danny Trejo in the role of Marcia Brady. On Thursday, Snickers delivered the whole ad along with a behind-the-scenes special. The ad for the Mars candy brand is the latest in its long-running "You’re Not You When Your Hungry" campaign. Thanks to some digital magic, Trejo is inserted in an episode of "The Brady Bunch," brandishing an axe. 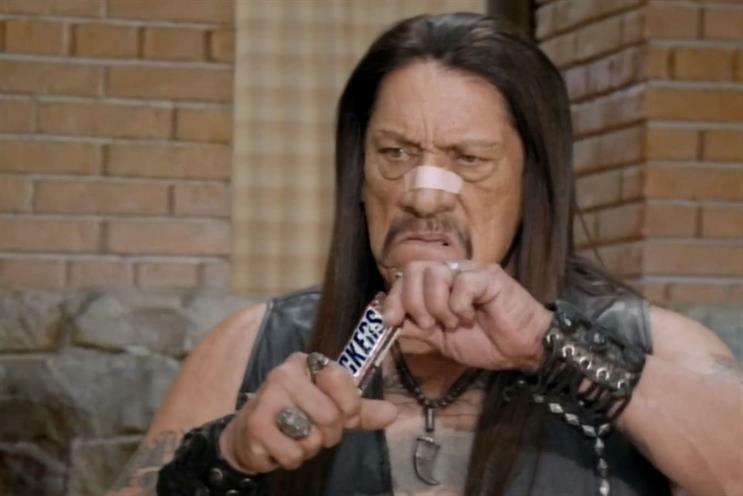 Upon eating a Snickers candy bar, Trejo transforms into Marcia Brady. The ad also includes Steve Buscemi as Marcia's sister Jan.
Nationwide Super Bowl ad: Too dark for Super Bowl? Betting on the Super Bowl: Which ads will win?